Or: This yarn is going DOWN! I’ve had this yarn in my stash longer than I’ve been knitting. 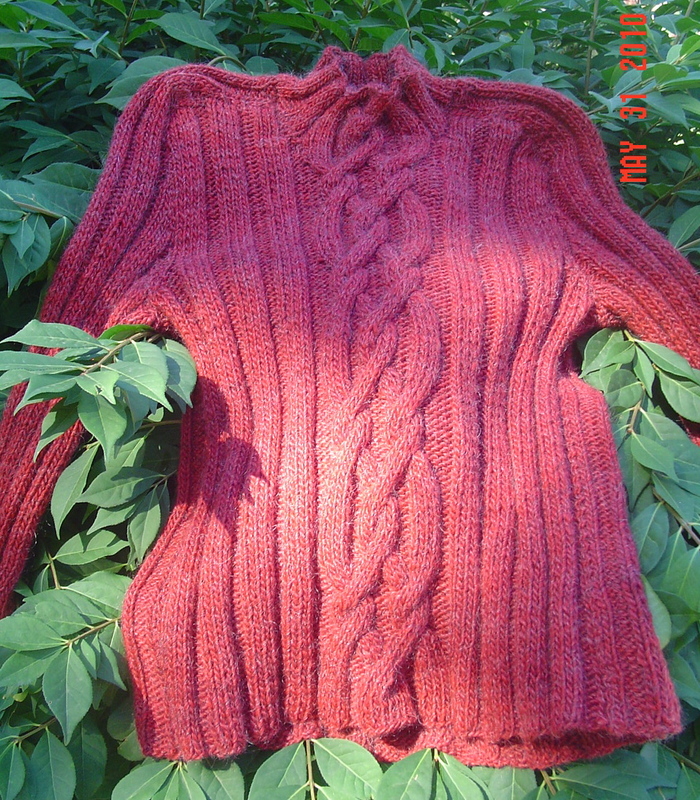 It is brown sheep lamb’s pride worsted, but it never did knit into a worsted weight pattern. And I tried, oh how I tried. I’ve knit sweater after sweater with this yarn only to have it go terribly wrong. Finally, my friend Sarah had me borrow a rowan cork pattern book, since that gauge is bulky, hoping that I could manage to get a proper gauge in a bulky pattern instead. And you know what? I did. Perfect gauge though I must say it isn’t a tight knit. But it works, and for me right now, that is what counts. The pattern is called Stevie. It is nice and big and comfy and really really warm. I love the cabling up the front and I hope that someone gets good use out of it. Will that be me? I am not sure. I am not overly fond of the ribbing throughout, but it may do well enough in the winter with a collared shirt under it. I am also tempted to bring it to my brother to see if he’d wear it. This weekend has been just about perfect. I’ve had what really does feel like a holiday, much has been accomplished around the house, much time has been spent with the Bug, much relaxing has been done, a few late nights and morning sleep in’s, and a lot of good craftiness. I couldn’t be more pleased. It also means I’ve a lot to blog about this week, stay tuned! I had myself convinced I’d finish the sweater this weekend. Then I remembered how long it takes for a blocking sweater to dry. I realized it wasn’t likely to happen. 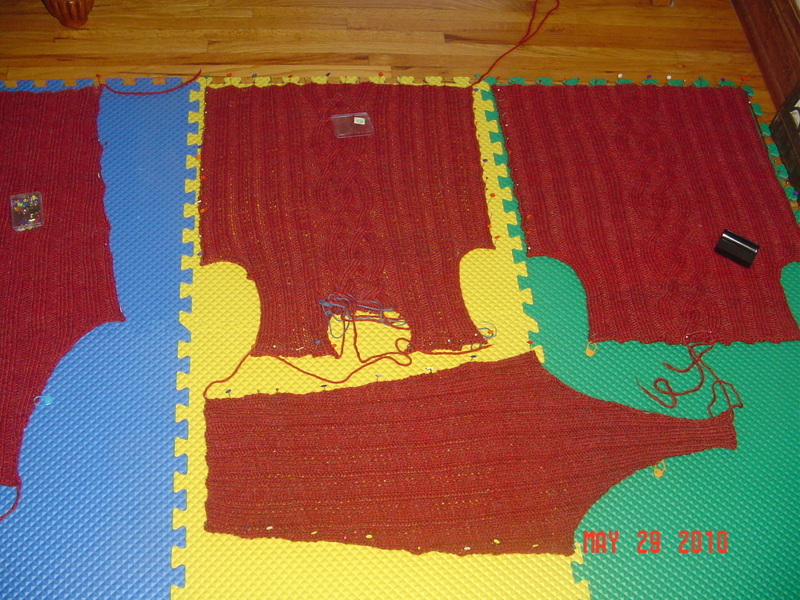 I finished all the pieces last night, the soaked and blocked immediately. This morning I realized that it will probably be dry by tomorrow. Now I have to remember just how long seaming and finishing takes. I need to remember that my entire day will consist of finishing this sweater tomorrow. But today is a day off from the sweater! I promised this a few days ago, but I was too busy spinning to get a picture. 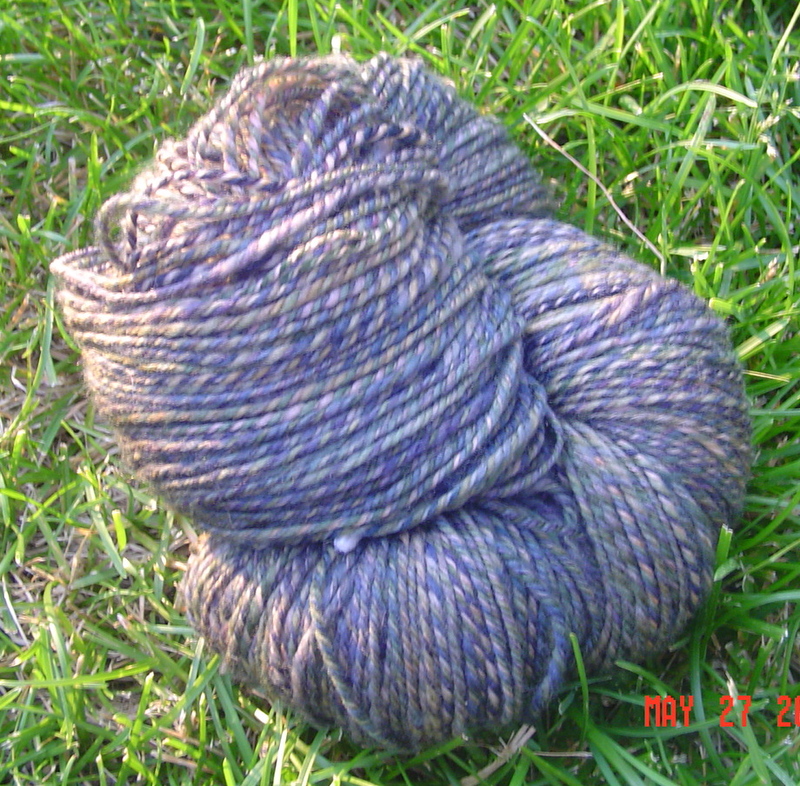 This is the 3 ply skein which Carin made for me out of her crown mountain farms roving. This is 340 yards of heavy fingeringweight yarn. I am telling you, it is uber soft, way softer than how I spin. Which is half the fun of trying someone else’s yarn! I am surprised at how this turned out after having watched it be spun. The colorway is Atlantis, and it had a lot of color in it. Random bits of pinks and yellows. But in the end it leans toward a camo color. I am not complaining, it is still really pretty…its just I never cease to be amazed at how different each roving looks once it is spun. This is what feeds the addiction, constant amazement! And I am not talking about my frankensleeve. I frogged that last week. Now I am talking spinning, as I’ve finally finished all 8 oz. of the BMFA merino, in colorway Froggin’. I got about 900 yards out of this yarn, in a 3 ply light fingeringweight yarn. I am convinced this is some of my best spinning yet, I suppose there is something to be said for both practice and the thought that someone else will be looking at this skein. I traded half of this batch for half of some crown mountain farms that Carin from Round the Twist spun. It is really nice to be able to trade half of such a large batch! 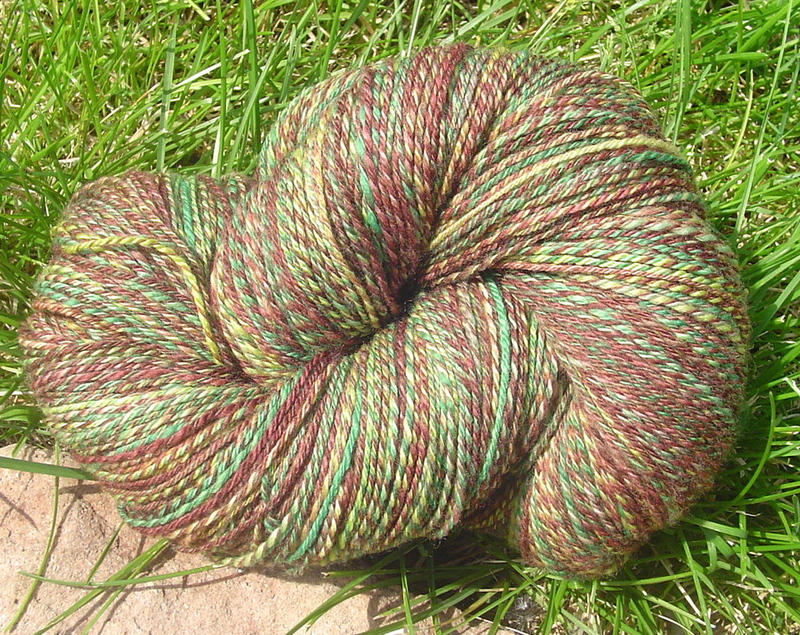 I’ll get a picture of that crown mountain farms handspun up tomorrow! Exactly one week ago I created a monster. At the time, I didn’t realize what I was creating, but once it was done, it became abundantly clear. I am not saying there weren’t a few red flags along the way….I just chose to ignore them, as is typical for me. By this time I had completed my sleeve. Only to realize that I had somehow managed to turn the booklet over and begin working on a sleeve for a different sweater about halfway through. Even though I haven’t finished anything major, I feel like I’ve spent the weekend wrapping up various projects, or various parts of projects. For instance, I finished the front of my current sweater and cast on the arms. I worked through the heel of a second sock for my mom in order that I could mindlessly knit when given the opportunity, and I finished spinning my 8 oz. of BMFA sheep to shoe kit. The sleeves still need to be knit, the spinning still needs to be plyed, but the mindless socks seem to have knit themselves into completion. Well, in actuality I am going to the post office soon and I thought it might be nice to send out some socks for mom when I go. Sorry mom, it feels rather cold this evening and I am keeping them on until I warm up a bit! 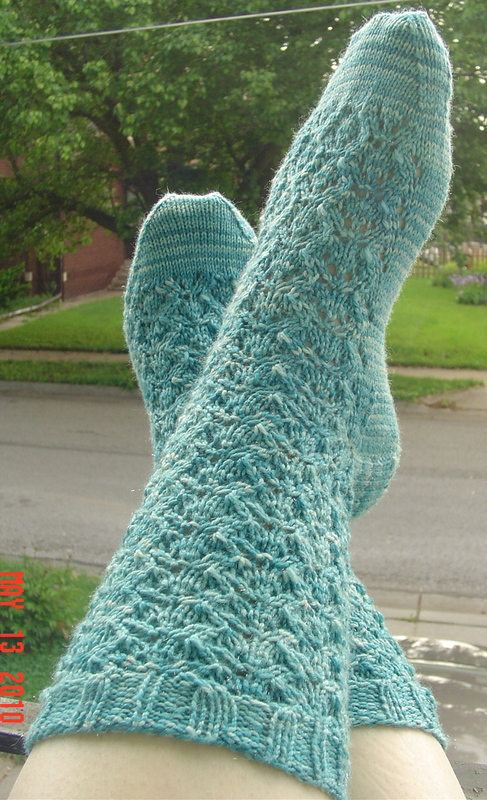 Clear enough for me to photograph the socks I finished last week! You could almost say it is sunny. You could NOT say it is warm. 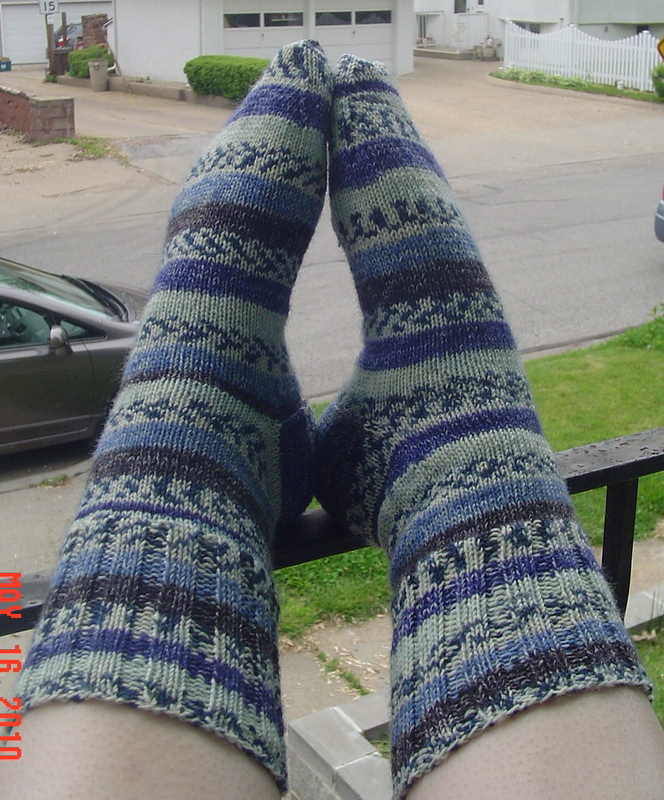 I’ve finally finished my Glynis socks that I was doing as a KAL with the Round the Twist group as well as entering in sock knitters anonymous for the month of April. The yarn is tempted yarns glam grrl, it has a bit of silver in it. I purchased this so long ago! I love the semi solid look of it and the yarn was lovely to work with. The finished sock is great too, fits really well, I look forward to wearing them. As soon as possible.